The short answer is there were books released for every season and some seasons (if not all??) had multiple books! The fan that made the old website said she bought the books at a bookstore. (Lucky!!) I've seen them come up sometimes on ebay... well, that was over 3 years ago now but... '''>.> There was at least one which I saved the listing pictures of that was not in this fan's scan collection, so unfortunately her collection was incomplete. The front cover tells you that inside are only two songs: Sailor Star Song and Kaze mo sora mo kitto... Only having a handful of songs seems to be common for these books. Looking at the scans I have, it's obvious that there are pages missing - not from the musical pages themselves necessarily but that are probably filler pages with screenshots or other tidbits as well as the table of contents and/or publisher info page. It's a shame she didn't scan the entire books, but I AM grateful to have what she did scan!! Does anyone else know anything about these books that were released for the 90s anime? It's too bad they're all for easy piano or else I'd have made more of an effort to collect the physical copies when I saw them for auction '''OTL. I wonder how many were published in total??? 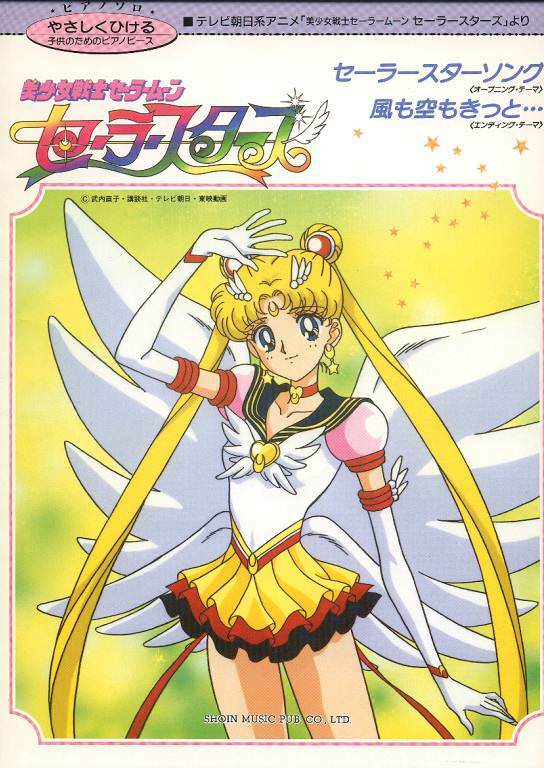 As a side note, for anyone interested in sheet music for Sailor Moon or other anime generally, dreamsinpink kindly provided some fan-transcribed resources in this thread. Oh yes, this is wonderful! The pamphlets for the musicals also have simple and short scores for the performed songs. Miss Dream has a collection of those scanned. Some were not fully covered by the scanning though. On a somewhat related note though, the many Sailor Moon MIDIs can sometimes be arranged into playable piano scores with the help of an editor. ]The front cover tells you that inside are only two songs: Sailor Star Song and Kaze mo sora mo kitto... Only having a handful of songs seems to be common for these books. Ah well that's a shame. I was hoping there were arrangements for more of the songs from the anime's seasons. Still, it's nice to have them. I'm guessing that multiple books would probably explain the large number of Sailor Moon R songs. It's too bad they're all for easy piano . My thoughts exactly. As an organist and amateur pianist, I've been tempted to delve into writing out more complex renditions myself, but haven't found the time. Anyway, thanks a bunch for sharing what you've found! actually, there are a few more complex arrangements from the Piano Fantasia books! It's the same arrangements as released in the album, though unfortunately many of them are written for four hands. I learned how to play these arrangements of My Blue Heart and Sora Kakeru Pegasus, and they're quite nice. I still have My Blue Heart memorized and play it semi-frequently. My sister and I also learned how to play the Tuxedo Mask and Outers themes, both of which are for four hands and are very fun! I printed out a whole bunch of the sheets from Rini's collection back in the day, I need to check my collection sometime when I'm home to see if there's anything I have that wasn't salvaged by the wayback machine. but it looks like none of the sheet music itself made it to the wayback machine . I have a few sheets from it downloaded, but not many. In any case, they are very simple and only include a melody line, not even any chords! So, I also found this site, but it's in Chinese, and all I can understand through Google Translate is that it's not actually free, unfortunately. Could someone double-check if interested? I'm just itching to get at those scores. nice find!!! Most of the sheets are the same as posted on Rini's, but there are some specific songs I've never seen uploaded before. i was messing around with the site a bit (made an account) and it appears you purchase with "points." one way of getting points is a daily sign-in bonus? But i think to get the daily sign in, you have to connect your card and it looks like it only accepts chinese bank cards. I tried using the QR method as well, but didn't have much luck there either. The good thing is, most of the song have relatively large preview pages, though of course none of them go through the whole song. Regrettably, I didn't have much luck either crawling Chinese sites for those. There was this unofficial adaptation, it seems, of Chibiusa's theme though (mirror), along with some other songs. That's so awesome that you got a chance to try the four hand pieces!! That sounds like a ton of fun! The arrangements in the Piano Fantasia album were such a let-down for me, after being spoiled by Piano albums from the Final Fantasy series so I never did bother trying to play them ^^;;. Though maybe now that some time has passed I'll enjoy it after all~. [...] In any case, they are very simple and only include a melody line, not even any chords! I checked out the pamphlets on Miss Dream that nm___i3bfc was referring to and they're credited to Junketsu.org's old webmistress. They indeed were only the vocal parts used by the main cast (and only for a few songs) but at least each one is the whole song! Maybe the scans you got from Junketsu itself were crops from the pamphlets? I was thinking it would be nice to crop them all and put them together for the Myu section, actually :3~. Yay more projects X'''''D. Feel free to post a new thread over there if you find your old files! Also, some really nice news is that ebay still has a few books that Rini didn't have up for auction :0. (This one, this one, and this one if anyone's interested... nm___i3bfc is right - there's a lot of R books XD. There's also five songs included in this anime best book, but the chances of them being alternate arrangements are pretty low I'd assume...) I might try to purchase one of them. Though it's also tempting to pick up one of the larger books that she *did* scan to find those missing pages! Lastly, to close the case on the Chinese site, I compared what it had in their previews to the scans I have. Long story short, there's nothing new in there that I don't have. This and this are fan transcriptions - it says so on the previews for them in the top corners. This one of Watashitachi ni Narikakute... I can't say for sure if it's a fan transcription or an officially published sheet or just some other piece that has nothing to do with the title, because there's no preview and the image they have is TINY. It doesn't match any of the scans or *styles* of page layout I have from Rini's book scans. However, it's only one page long, whereas the one official book scan I have for that piece is four pages... I don't know if a different arrangement would end up being much shorter what with the bridge and all... Basically, it's pretty sketchy and unlikely to be what it's professing to be. SO... guess I better get these scans up so you guys can enjoy them xD. I'm on my computer now so gimme a few minutes... I'll edit this post here if nobody replies to my other comments first ^^;. First up, the Piano Fantasia scans! Again, I noticed a few pages missing based on the page numbers between songs. So sad!! Also, my apologies but the order is a little messed up for the duets because when I downloaded it, Rini had separated the parts (and labelled them on the image as well, actually). When you print it, you should have a page from the high part on one side of the book and a corresponding page from the low part on the other so the two players can read side by side. In any case... easier to rearrange paper with page numbers on the bottom than digital files, so I leave it to you ^^;;;. I'll try to get another few books up tomorrow! I zoomed waaaaaaaaaaay in on the preview, and it seems to be the right song, but only one verse and without the refrain. So, not really worth it. And OMG, thanks so much for the uploads! I'll have to get to the piano with these later today. 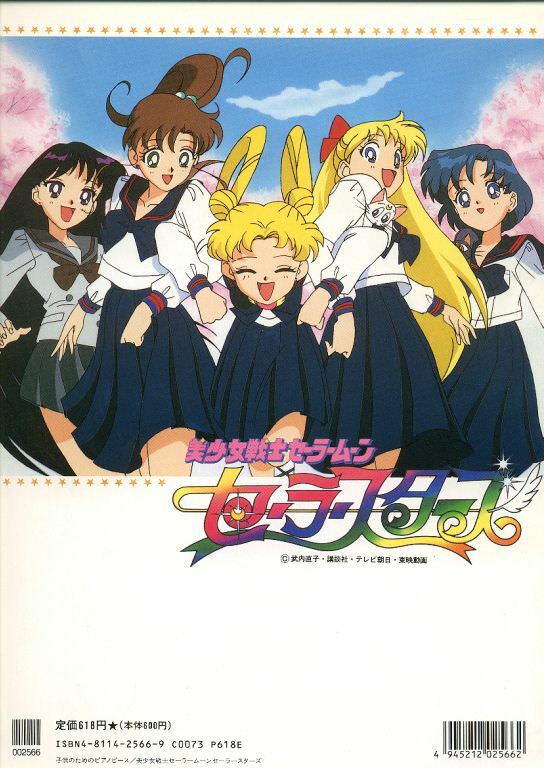 It's the book associated with the Sailor Moon R song album, ~Mirai e Mukatte~! It has all the tracks, according to the back cover. Oddly enough, (and confirmed by a picture of the table of contents on ebay) the songs do not appear quite in the same order as on the album. Sadly, Rini did not bother to scan a bunch that were (I hope) exactly the same arrangements as in other books. Even sadder is that her scans also didn't include Dakishimete Itai, of any version - even though it's listed on the back cover! It doesn't list it on her site page at all. In any case, here's the album of what we've got! I'll try to post a fuller one next time! Thank you, these are awesome. I hope I can try them soon! So I finally got around to retyping and printing some of these, and had a lot of fun working a little on My Blue Heart, a favorite of mine. It's not very good (I just started practicing this afternoon), the sound quality is terrible (I only have my laptop microphone), and the piano pedals were squeaking; but I wanted to share what I was able to play of it as another THANK YOU! to Diagnosed. I really appreciate being able to play my favorite Sailor Moon music thanks to your uploads! Rest assured I'll continue working on perfecting some of these songs! Been a while but hey my kid's asleep and my husband's out playing frisbee so THIS MOUSE WILL PLAY XD. I've added a photo of the book's table of contents to the Imgur album from an ebay listing, similar to my Mirai e Mukatte album. This is definitely the biggest sheet music book from what I can see, and all from Season 1. Sadly, this one had more disappointments... Tuxedo Night was not scanned (one of my low-key favs too ;_ , and neither was Hottokenaiyo, Tsukini Kawatte Oshiokiyo (two cute little Rei-Ami-Usagi songs) or Toki wo Koete... (Mamoru's image song). And once again, any pages that were between songs that may have included stills from the anime or anything else are not scanned. Here's what she DID so graciously take the time to scan at least!! Aikotoba wa Moon Prism Power Make up! There was a "Hottokenai Yo" sheet? Ooh, a 15-song collection ! I guess we'll have to keep looking. Well thanks for searching these up.